Graham-Cassidy, like all Obamacare repeal, is built on lies. Every attempt to repeal Obamacare has been built on lies. Graham-Cassidy is no different. 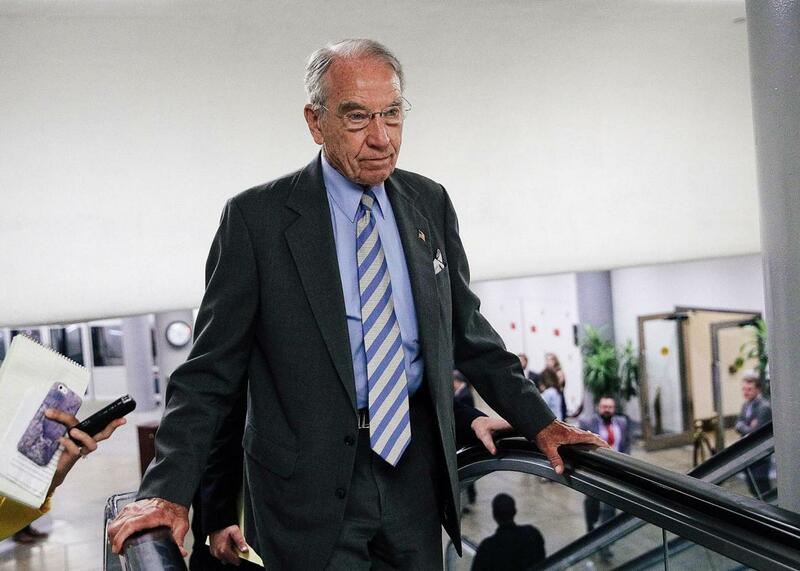 Sen. Chuck Grassley arrives for a vote at the Capitol earlier this month. This honesty was noteworthy—it was newsworthy—because it pierces a cloud of dishonesty. We know what Graham-Cassidy, the Republican health care bill, would do. It would slash Medicaid and other federal health care spending, ending health coverage for tens of millions of Americans. To Democrats, this is intolerable. To many Republicans, this is what it means to have a “small government” society; this is the system working. But it’s at odds with the party’s promises of the past seven years: repeated pledges to repeal Obamacare and replace it with something cheaper, better, fairer, and more comprehensive. Republicans can’t square that circle, so instead, they’ve opted to lie and hope, amid the scramble, they get away with it. One of the most egregious lies comes from Louisiana Sen. Bill Cassidy, namesake (along with South Carolina Sen. Lindsey Graham) of the bill in question. Cassidy, who is also a physician, was a rare Republican voice to express concerns about the Better Care Reconciliation Act, the Senate counterpart to the House’s American Health Care Act. In a May appearance on Jimmy Kimmel’s late-night show, Cassidy supported the comedian’s belief that “no family should be denied medical care, emergency or otherwise, because they can’t afford it.” Deeming this the “Jimmy Kimmel test,” Cassidy said he would reject legislation that couldn’t meet it. The BCRA couldn’t (though Cassidy would later vote for the notorious “skinny repeal”), and as Kimmel pointed out in a recent monologue, Graham-Cassidy can’t either. It works by ending Obamacare regulations on insurers and replacing federal subsidies with block grants, giving states the “flexibility” to build their own health insurance systems. But for most states (especially those that accepted Medicaid expansion) those grants are smaller than what the states had been getting under the Affordable Care Act. The effect, according to one projection from the Commonwealth Fund, is massive coverage losses, with an estimated 32 million people losing health insurance over a 10-year period. This is false. The only states “passed by” the ACA are those that refused to implement its provisions; depending on state actions, people with pre-existing conditions could be turned away from insurance, and even if they weren’t, they may not be able to afford the price. It is telling, in all of this, that Graham and Cassidy are pushing their bill without an official “score” from the Congressional Budget Office—they didn’t leave the CBO enough time to produce one. It suggests they know their claims won’t stand to scrutiny. The most visible and vocal Republican to lie about the provisions of Graham-Cassidy is President Donald Trump. “I would not sign Graham-Cassidy if it did not include coverage of pre-existing conditions,” he said on Twitter. “It does! A great Bill. Repeal & Replace.” It doesn’t. Although, in fairness to a president not known for his grasp of policy, he may not know the details of the bill. If true, he wouldn’t be alone. When Vox asked several GOP senators to explain what Graham-Cassidy does and how it affects the public, they fell short, leaning heavily on platitudes about small government. “More state innovation. More input from the states,” said Georgia Sen. Johnny Isakson when pressed on what he liked about the bill, giving a typical answer. But it’s not just Graham-Cassidy: Republicans have had a hard time telling the truth about their health care plans with every attempt since Trump took office. From the moment they introduced it in March, House Republicans lied to sell the American Health Care Act, their version of Obamacare repeal. “We’re not taking a benefit away. Nobody on Medicaid is going to be taken away,” said House Majority Leader Kevin McCarthy. After Republicans amended the bill to let states waive key regulations protecting consumers with pre-existing conditions, Speaker Paul Ryan insisted that the opposite had happened and that the AHCA protected sick people from being overcharged for health insurance. Later in the summer, when Senate Republicans were rushing to pass the Better Care Reconciliation Act, key lawmakers lied about its major provisions. “The Senate bill will codify and make permanent the Medicaid expansion,” said Pennsylvania Sen. Pat Toomey, an architect of the proposal, when pressed on its details. “And, in fact, we will have the federal government pay the lion’s share of the cost. … No one loses coverage.” Only legalese kept this from being a lie. No, the BCRA didn’t directly end the expansion. But it capped the amount of money Washington gives to states to pay for each Medicaid patient and changed the funding formula, slowing the increase over time. The result, in practice, was a massive cut to the tune of more than $800 billion. In that world, yes, people would lose coverage. To the extent that Republicans like Grassley and Roberts have been honest about Graham-Cassidy, it’s to state plainly their single-minded pursuit of Obamacare repeal. And with most of the Republican caucus behind the bill, it’s clear that they aren’t alone. They have to pass the bill because they have to pass the bill. Everyone knows this, or, at least, everyone behaves as if it were true. Which, perhaps, is why these two veteran senators felt confident enough to state that truth. The political motivations are so transparent that it’s practically clear to everyone that the lie doesn’t even matter.